Cyber Monday hasn't just been a busy day for online shoppers--it's been a busy day for the U.S. Department of Homeland Security, as well. Over 150 websites were shut down today by federal authorities for selling or distributing counterfeit goods, such as pro sports jerseys, golf equipments, DVD sets, footwear, handbags, and sunglasses. The operation is the eighth in a series of raids called "Operation In Our Sites," which is a cooperative effort of the U.S. Immigration and Custom Enforcement's (ICE) Homeland Security Investigations, the National Intellectual Property Rights Coordination Center, the U.S. Department of Justice, and the FBI. Federal agencies launched a similar raid on counterfeiters last Cyber Monday, closing down 82 websites. The closed sites now display a notice that they have been closed for copyright infringement. "For most, the holidays represent a season of good will and giving, but for these criminals, it's the season to lure in unsuspecting holiday shoppers," ICE Director John Morton said in a statement. "More and more Americans are doing their holiday shopping online, and they may not realize that purchasing counterfeit goods results in American jobs lost, American business profits stolen, and American consumers receiving substandard products." "The ramifications can be even greater because the illicit profits made from these types of illegal ventures often fuel other kinds of organized crime," Morton added. Since "Operation In Our Sites" was launched in June 2010, 350 domain names have been seized. Of these seizures, 116 have been forfeited and are now the property of the federal government. After seizure, the websites become billboards for educating the public about counterfeiting. The IPR estimates that the counterfeiting sites have received 77 million individual page views since they were seized. Operation In Our Sites has been criticized by online rights groups, such as the Electronic Frontier Foundation (EFF). "Domain name seizers are blunt instruments that cause unacceptable collateral damage to free speech rights," EFF Senior Staff Attorney Matt Zimmerman argues. 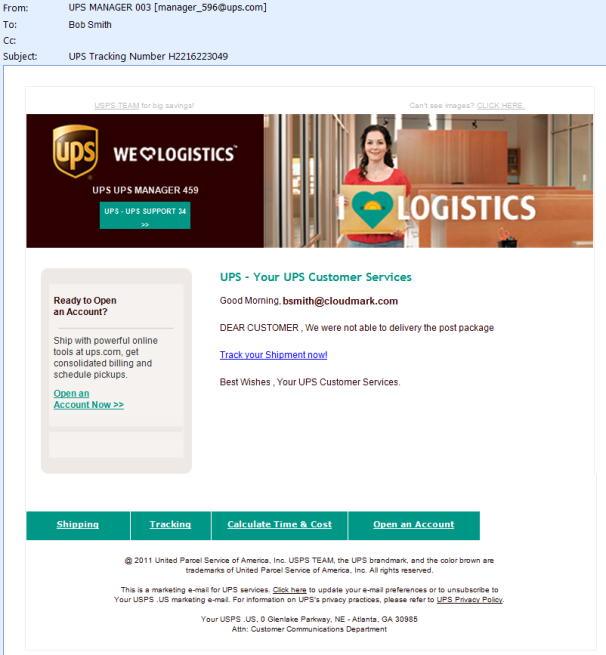 It's not just counterfeiters that are preying on online shoppers, thought--according to spam fighter Cloudmark, a massive spam campaign has been launched, disguised as UPS notices. The spam looks like a notice from the United Parcel Service, and claims that individuals' packages cannot be delivered on time. "The 'from' address is faked so that it appears to come from the domain ups.com," Angela Knox writes on Cloudmark's blog. "Many of the images are copied from legitimate UPS emails and many of the links go to the legitimate UPS site." These are not legitimate UPS notices, however, and so clicking the 'Track your shipment now' link will take you to a website that will deliver a virus. Cloudmark advises customers to take the time to check the original shipping confirmation that comes directly from the online vendor where the purchase was made. If you must check UPS's site, go directly to UPS and plug in your tracking number--don't click on any links from emails.